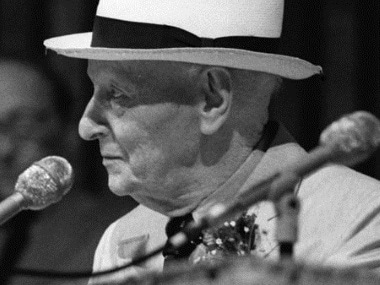 In this monthly column, Jai Arjun Singh scours through his bookshelves to pick out titles that have impacted him at various times in his life. The first of these is reductive, unanswerable, even pointless if you direct it at anyone who has been a greedy reader from an early age, having been encouraged by a parent to read as widely as possible. 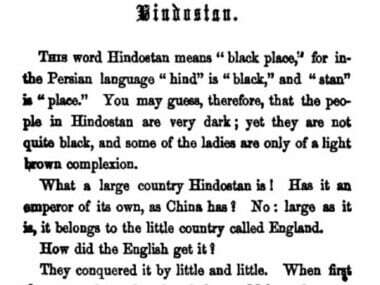 Even without considering all the colouring books that one must have sullied as an infant, how can one be certain of the very first book they read? Yet a cover image does come into my mind when I hear the words “first book”. It’s an illustration of a very large dead creature lying on the ground in a jungle, while a smaller creature stands disrespectfully on the corpse, looking pensive. 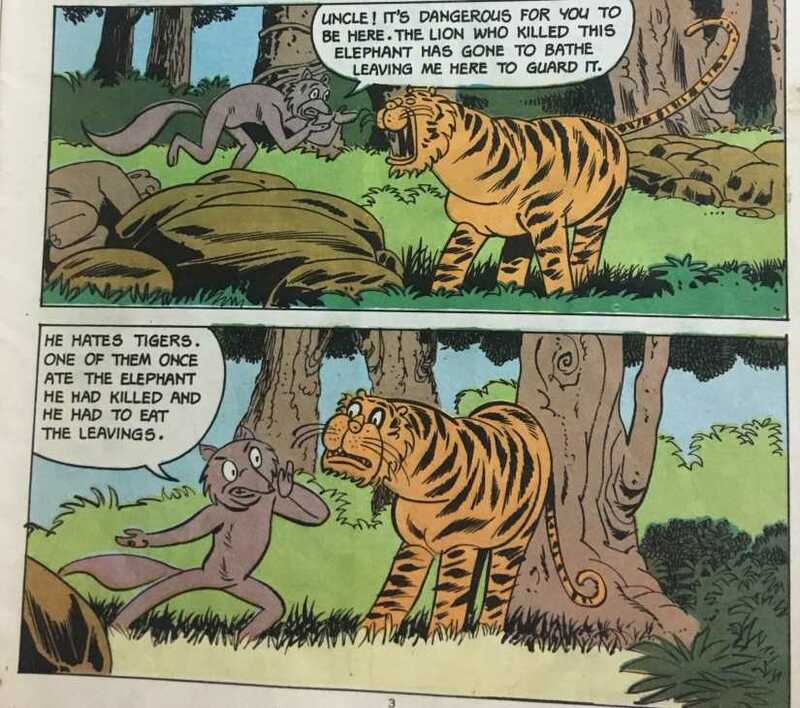 Reader, meet Amar Chitra Katha title number 163: Panchatantra – How the Jackal Ate the Elephant, and Other Stories. This could be a manufactured memory, but I’m almost sure it’s true: We are parked outside the disordered Malviya Nagar market in South Delhi, I’m sitting in the car, waiting (possibly because it is raining outside; in my mind, it was always raining and dark and muddy in Malviya Nagar’s back-lanes), and my mother hands me a comic, or a bunch of comics, one among which is the jackal-elephant one. I think I remember blinking at that cover for the first time, sitting in the back seat in the dim evening light. So, an image of death straight away, but there’s more to come. Turn the page, ye inquisitive tot, and find that here, in a comic book created for the delight and edification of children, is a story about a jackal coming across an elephant carcass (“All this meat! All for myself! I need not look for food for weeks”) but needing the help of an animal with sharper teeth to help him make a tear in the thick hide, so he can feast on the delicious, juicy meat within. 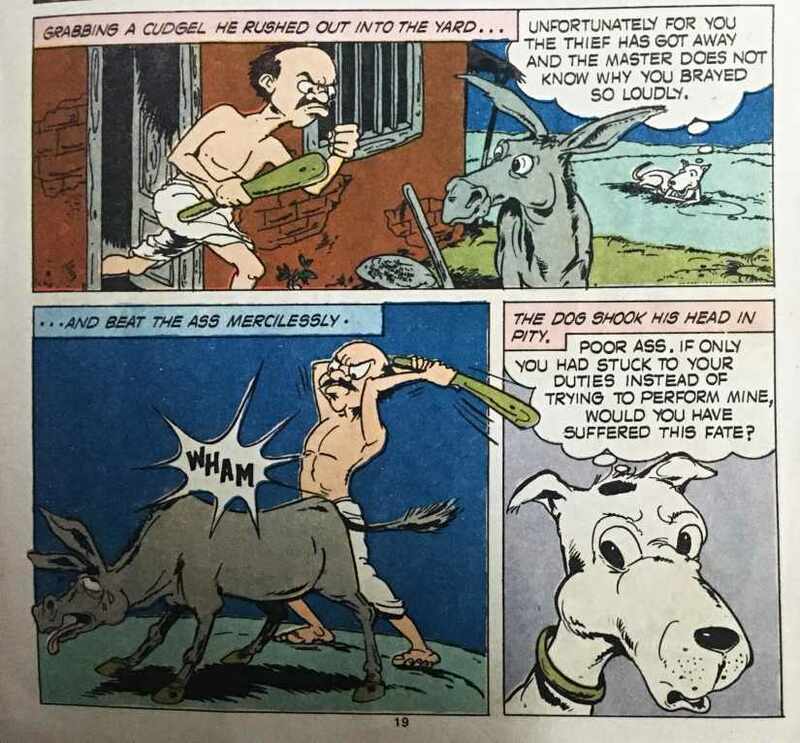 When I recovered the jackal-and-elephant comic from an ancient closet recently, I realised that this was one of the more unaesthetic Amar Chitra Kathas. 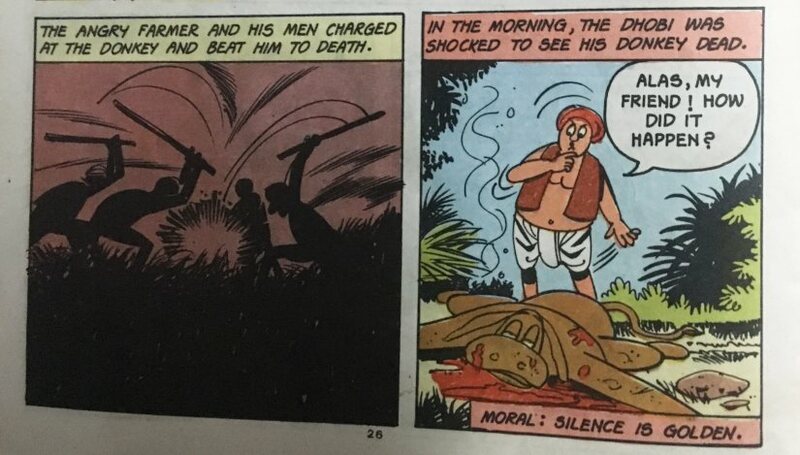 The colours run into each other, or spill outside the lines, which could be a printing problem (I don’t see it in online images from a newer edition of the comic), but there is also something careless and ungainly about the actual drawings, done by Ram Waeerkar, who also illustrated a great deal for Tinkle. The jackal, when he stands on two legs, looks disproportionate, like a very gangly human – the anthropomorphising is too in-your-face. Other images, such as a tiger bounding away in fright, are tacky. Taking out a few other ACK comics, I noted clear variances in the quality of the artwork. Hitopadesha: Choice of Friends and Other Stories, for instance, is packed with much more detailed illustrations – by Jeffrey Fowler – while Ashok Dongre’s work on another Hitopadesha (How Friends are Parted, and Other Stories) has a distinct, quirky character. Since many of these stories feature the same animals and similar incidents – including a distressing number of donkeys getting mercilessly beaten – the comparisons become easier. I briefly wondered if the casual artwork in How the Jackal Ate the Elephant was deliberate, given the inherent unpleasantness of the tale. Perhaps they wanted to avoid making things too realistic? But that can’t be it. 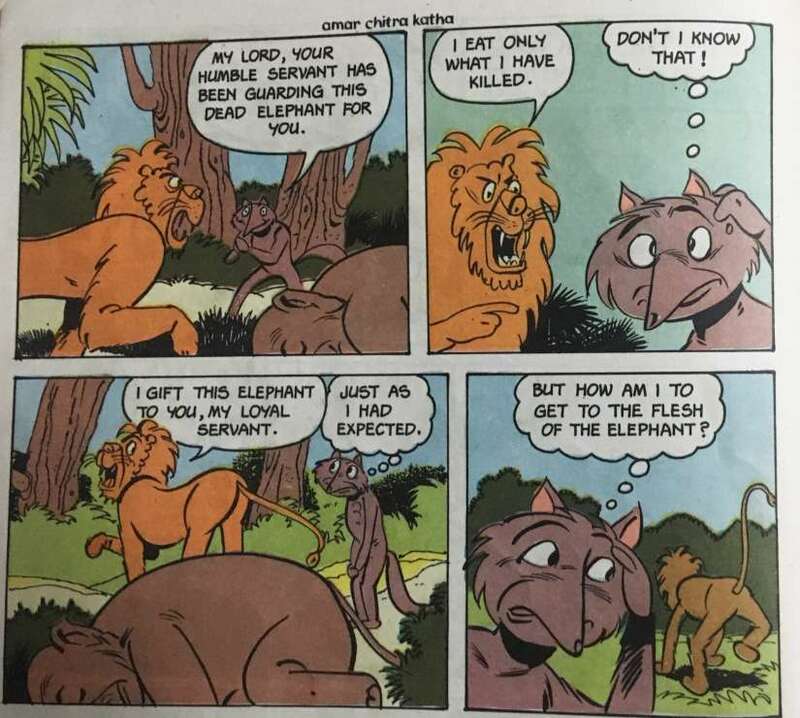 We see blood flowing from the elephant’s hide only in two panels, and there were other, better-drawn ACK comics around the same time with grislier content. Consider Vishnu’s avatar Narasimha tearing open the chest of the asura Hiranyakashipu in the 88-page bumper issue Dasha Avatar: The Ten Incarnations of Vishnu, drawn by the celebrated Pratap Mulick.